Saturn Sands | Life on the Mojave: What's in a name? 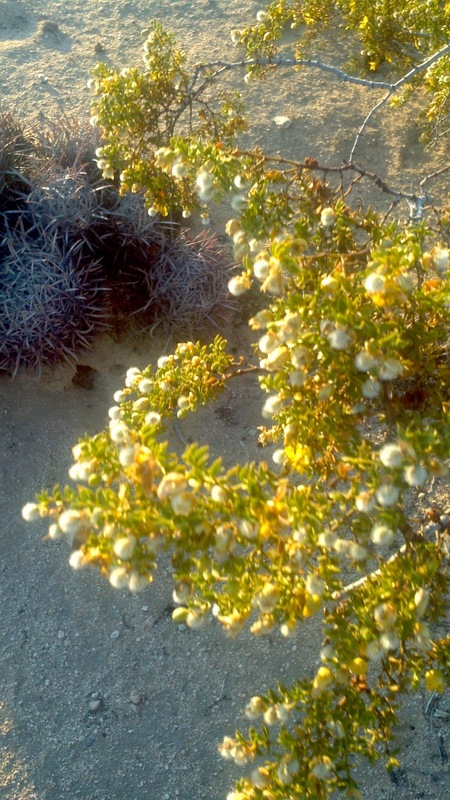 If you've read my previous posts you know that I hate that the common name for Larrea Tridentata is "creosote bush." Creosote is the byproduct of the distillation of tar. Someone in the past thought that the bush smelled like creosote and the name stuck, though I believe many more people think it smells like rain. So for awhile I've been calling it Larrea. It was named thus after Don Juan Hernández Pérez de Larrea, a Catholic bishop (Spain) and botanist. Though it's unclear if the Bishop traveled to North America the Spanish missions in California were no friend to the indigenous peoples of the Morongo Valley. For that reason I'm hesitant to hew to the name Larrea for this important plant. In my quest for a better name I wrote to the Salt River Pima-Maricopa Indian Community. I had read a creation myth attributed to the Pima which featured the creosote bush and thought that they must have a name for it. Elaina Fay Osife replied and told me the word I was looking for was "...“shoegoi” pronounced (sho’goi) or (shoe-goy)." I've also written to the Agua Caliente Band of Cahuilla Indians but have not received a reply. It seems if we are to engender respect and even love for this plant it's important to refer to it respectfully and to associate it with peoples that first named it and loved it best.